This past weekend, a supertall skyscraper, years away from completion, became the world’s tallest freestanding structure. That alone would have captured my attention – I’ve long been a fan of tall and supertall buildings. But this new tower – which, once finished, will rise almost a kilometer skyward – also happens to stand on the edge of the Persian Gulf, a region that uniquely piques my imagination. The Burj Dubai (برج دبي “Dubai Tower”) is rising over the emirate’s “New Downtown.” And the tower’s impressive stature is already apparent. At 1,680-foot (512 meters), the incomplete tower has already surpassed Taiwan’s Taipei 101 which has dominated the global skyline at 1,667 feet (508 meters) since 2004. And while the Burj Dubai’s final height has been kept secret, the state-owned development company, Emaar Properties, said only that the tower would cap out well above 2,651 feet (808 meters) with the Burj’s spire visible 60 miles away. At that height, the Burj Dubai will not only be the world’s tallest free-standing structure, it will be the tallest land-based structure to ever built. Scheduled for occupancy in 2009, the $1 billion skyscraper is part of a 500-acre, $20 billion development located at the “First Interchange” along the city’s iconic Sheikh Zayed Road. The tower will feature more than 160 floors, 56 elevators, luxury apartments, boutiques, swimming pools, spas, exclusive corporate suites, Italian fashion designer Giorgio Armani’s first hotel, and a 124th floor observation platform. I can’t help but be reminded of New York or Chicago in the 1920s and 1930s, when those American metropolises erupted skyward with such a multitude of skyscrapers that they’ve only recently been surpassed in height, and have yet to be surpassed in the number of tall buildings. Indeed, following the American model of 20th century prosperity and skyward development, many Gulf states are eager to show off their success with ever taller buildings. As such, Dubai’s supertall skyscrapers reflects the city’s rapid economic growth and hunger for global prestige. The Burj Dubai will also let the Middle East reclaim the world’s tallest structure. Egypt’s 481 feet (147 meters) Great Pyramid of Giza, built around 2500 B.C.E., held the title for over 4,000 years until the Lincoln Cathedral was built in 1311. Skidmore, Owings and Merrill, the Burj's American architects and engineers, report that the Burj Dubai will fulfill the Chicago-based Council on Tall Buildings and Urban Habitat’s four criteria for the tallest building: the height of the structural top, the highest occupied floor, the roof’s top, and the spire’s tip, pinnacle, antenna, mast or flag pole. But this tower may not hold the title “tallest structure” for long. Only a few kilometers away from the Burj Dubai site, the Al Burj (“The Tower”) is being developed. Al Burj’s final height is being held tightly under wraps, but recent reports indicated that this tower’s projected height may rise to 1,200 m (3,937 ft) with at least 200 floors. Al Burj would be over three times the height (to the top inhabited floor) of the iconic Empire State Building, and four times the height (without the antenna) of the Eiffel Tower. But although ground leveling and land reclamation has begun on the Dubai Waterfront, construction of the tower itself has not yet started so the project’s eventual destiny remains in question. 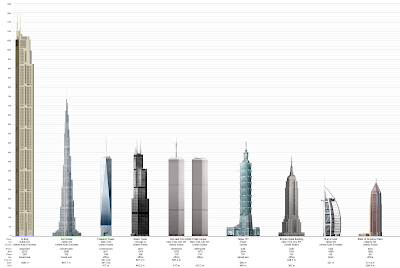 A comparison of Al Burj and Burj Dubai’s projected heights in comparison to several notable tall buildings, including the Freedom Tower, the Sears Tower, the late World Trade Center, the Taipei 101, the Empire State Building, Dubai’s iconic Burj al-Arab, and Atlanta’s Bank of America Tower. Artwork from SkyscraperPage. The region is not without tall buildings, to be sure. Saudi Arabia’s Kingdom Centre, which rises almost alone from Rihyad’s low skyline, is a distinct and striking tower nearly 1,000 feet tall. Other proposed supertall skyscrapers include the Murjan Tower in Manama, Bahrain, planned to be 1,022 m (3,353 ft) tall with 200 floors, and the 1,001 m (3,284 ft) Mubarak al-Kabir Tower to be erected in Kuwait as part of a massive development project called Madinat al-Hareer (“City of Silk”). Nor is the Burj Dubai’s impressive scale and ambition isolated in the rapidly growing emirate (evidence of the city’s rapid growth can be readily seen in NASA photography of the region taken between 1973 and 2006, at right). The decision to build Burj Dubai and other skyscrapers is reportedly based on the same motive to diversify from a trade-based economy to one that is service- and tourism-oriented. Dubai is aiming to boost the numbers of tourists visiting the country from the current 4.5 million per year to twice that number in just five years’ time. These tourists are primarily looking for accommodation close to the water, but the problem is that Dubai’s coastline is only about 18 miles long. Sheikh Mohammed of Dubai has therefore developed an ambitious plan to create four offshore islands, shaped to generate the greatest possible length of shoreline. The first and smallest was completed in 2004 and is shaped like a palm tree. Another phase under construction will comprise 264 smaller islands forming a vast map of the world. Rumors suggest that English rocker Rod Stewart has already purchased the island standing in for Great Britain. While the media focused on Burj Dubai’s progress toward unprecedented height, critics point out the plight of the 4,000 Indian, Pakastani, Chinese, and other foreign laborers who toil around the clock in Dubai's sizzling summer with no set minimum wage. Most of the workers have their passports taken up by their employers and are not allowed to return under any circumstances until their contracts expire. Press reports indicate that skilled carpenters at the site earn $7.60 a day, and laborers earn $4.00. Human rights groups regularly protest against labor abuse in Dubai, but local media rarely report such complaints. 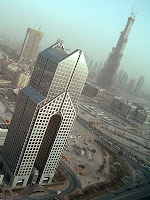 Regardless of achievement or criticism, the Burj Dubai reflects the rapid growth of the United Arab Emirates – Dubai in particular. With more tall and supertall project under development and construction in Dubai than any other city on Earth (most of which tower above or match in height the world’s established clutch of tallest buildings) and with large American and European companies pouring into the city, the tiny Emirate may be poised on the brink of global commercial eminence. We'll be keeping our eyes on it.